in order to move on to the next part of their journey to find the secret path, rescue the maiden, or bring back the treasure. Often, the Portal is protected by some kind of guardian, which the hero must befriend, subdue, or kill in order to safely pass. It always seems to turn out that what the hero really finds on the other side of a Portal is him or her true self. 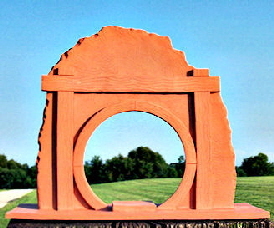 Our Mesa Creative Arts Portals are just such archetypal doorways that open to other dimensions and other energies than our "normal" 3-D reality. Our Portals are made from ceramic clay and are fashioned to represent architectural ruins of doorways, gateways, windows, and keyholes. Artist and Healer Brad Silberberg makes them in the highly purified energy atmosphere inside our 8 foot diameter Heliosphere with the intention that they be real, functional openings to the energy, wisdom, and healing from other dimensions, and so they are. They create an interface that joins tow different worlds together and can be programmed to connect with any reality you choose. Anything that goes through their opening goes into that reality and is altered by it. Just passing a crystal, piece of jewelry, or some other object through the Portal's opening changes their energy and adds something not present beforehand. 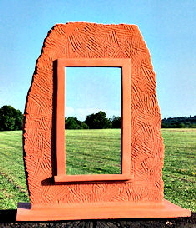 Passing a photo of a person through these Portals seems to change the energy of the person pictured and can bring deep healing when the Portal is programmed to connect with a healing dimension. These ceramic creations are not only openings to healing, but windows of opportunity and doorways to change. The energy coming "in" from the back to the front of the openings is different than the energy going "out" from the front to the back and the direction(s) that an object or photo is passed through matters as to the effect achieved. Our own lives have changed and rapidly improved since we began making and using these magical openings. As well as having the ability to connect to other realities like our doorway and window Portals, our Keyhole Portals are very powerful for unlocking things; situations, healing, creativity, ideas, and who knows what. They also have the ability to make objects that are put into them into keys to unlock other things. What do you need to unlock in your life? Most of our Window and Door Portals are approximately 6-7" high and wide, with our Keyholes being somewhat smaller. Their size is only limited by the dimensions of our kiln and the working characteristics of the material. We also make Mini Portals that you can place in a plant pot or other hidden space or wear as jewelry. When worn around the neck they help to open and protect your Heart Center, allowing higher-dimensional energies to flow through. Our Portals sell for $150-$180 USD for the Door and Window Portals, $100 for the Keyholes, $50 for the 3-D Mini Portals, and $30 for the flat Mini Portals. All prices are without shipping. Call 724-947-3097 or email us to see what’s available. Brad Silberberg is an artist and holistic healer who envisioned The Mesa Creative Arts Center and Mesa Healing Center as a place of awakening for art, healing, and spiritual expansion. Copyright ©2004-14 All Rights Reserved by Mesa Creative Arts, Inc.